Chateau Beychevelle, due to its classic, stunning architecture of the chateau and beautiful gardens, is often referred to by its fans as the Bordeaux version of Versailles. However, the history of Beychevelle dates back much further than that. In its formative years, it was the property of the Foix Candale family. The Foix Candale were well established in Bordeaux by 1446, as they already possessed Chateau dissan in Margaux. In 1565, Bishop François de Foix Candale commissioned the building of the grand chateau at Beychevelle. Eventually, Beychevelle became the property of the Dukes of Epernon. To understand the Duke’s power, it’s important to note that all the ships sailing in front of Beychevelle were ordered to lower their sails as a sign of respect. In fact, that is where Beychevelle took its name. Chateau Beychevelle, when translated from the dialect of the times, which was Baisse Voile, means lower the sails. 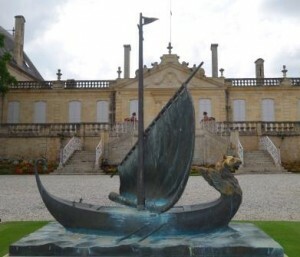 This event is the inspiration for their label design and is honored with the statue of the boat in the garden, at the rear of the chateau. A delicate, harmonious wine. The palate is fresh and elegant with notes of red berries. Silky tannins. A delightful wine in its youth. Brulières de Beychevelle's 12 hectares of vines are 5 km from Beychevelle's vineyard; being further from the Gironde estuary, they benefit from a cooler climate. The vineyard is in the Haut-Médoc appellation and has been managed organically since 2008. Brulières' blend consists of just two grape varieties: Cabernet Sauvignon and Merlot. Vinified and aged in a separate winery, it is produced with the same level of care as Château Beychevelle and Amiral de Beychevelle.